E. Krauss was a French camera and lens maker, founded in the late 1880s. Founder Eugen Krauss was the brother of G. A. Krauss. The company had a license to produce some lens types of Carl Zeiss. In addition to cameras and camera lenses, Krauss produced Telescopes and Binoculars, many of them Zeiss models sold under license. 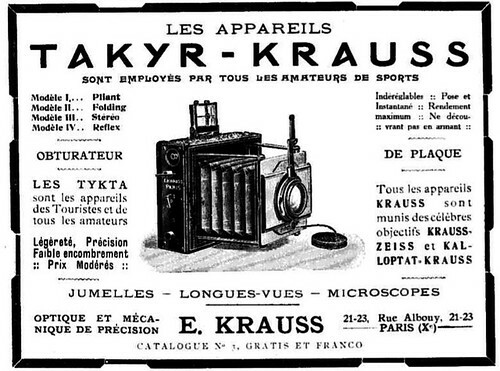 Advertisement for the Takyr and Tykta cameras, 1908–9. Scan by Henry Thomas (Image rights) Advertisement for Krauss Zeiss lenses, 1926. This page was last edited on 6 December 2016, at 11:40.